The Corentium Home by Airthings radon detector is a state-of-the-art measuring instrument that combines ease of use and performance. 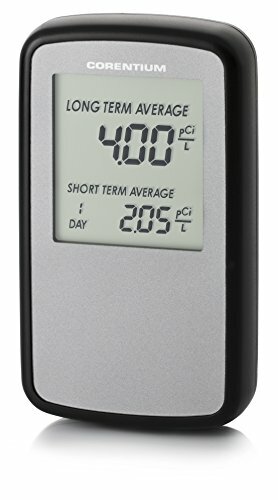 The Corentium Home by Airthings radon gas detector allows you to take a reading of the radon levels and its LCD screen displays the average daily, weekly and long term concentrations. Powered by 3 standard AAA batteries, the radon monitor makes it easy to take measurements from one room to another in order to get an overview of the concentrations of radon in a home, workplace, school, a daycare centre or any other location. The Corentium Home by Airthings radon detector is also an essential tool to use when performing property inspections or when checking the operation of a radon mitigation system. The internal architecture of the Corentium Home by Airthings radon monitor comes from advanced technology normally reserved for commercial-type detectors. Particular attention has been paid to the quality and protection of the internal components, allowing the use of algorithms for signal analysis that are more sophisticated. The Corentium Home by Airthings radon gas detector quickly adapts to its environment and eliminates inaccuracies related to external factors, allowing it to obtain the best accuracy in its niche. The Corentium Home by Airthings radon monitor is guaranteed for one year and in normal home use, it requires no annual calibrations throughout its useful life, estimated at over 10 years. If you have any questions about this product by AirThings, contact us by completing and submitting the form below. If you are looking for a specif part number, please include it with your message.